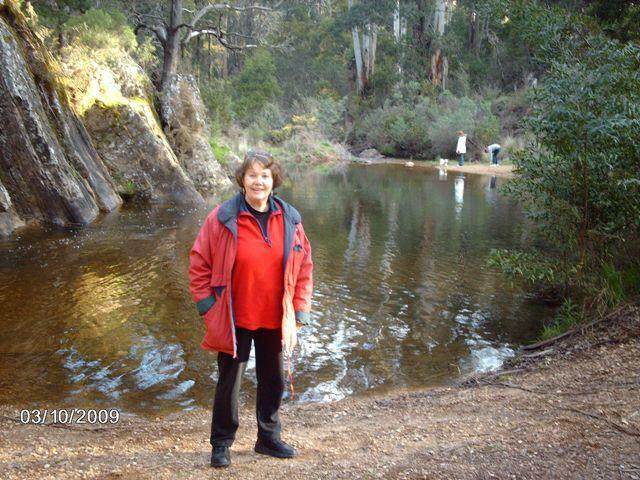 Margot Hitchcock at Golden Point Swimming hole, Lerderderg River 2009. Official Historian – For the BLACKWOOD AND DISTRICT HISTORICAL SOCIETY. Margot Hitchcock went to the first meeting of the Blackwood & District Historical Society on the 14th April 1973, and became a member and was voted on the committee and has been Official Historian since 1980. Margot has researched much of the early history of Blackwood in her capacity as Official Historian. Blackwood is an old gold mining town with gold having been found there in 1854. Rich in early history Blackwood was one of the biggest gold mining areas closest to Melbourne. Margot is pleased to do some research for people on their ancestors who lived at Blackwood and provide information on places of interest or aspects of Blackwood. Author – Margot is co-author of a book – “ASPECTS OF EARLY BLACKWOOD, – The Goldfield, The Landmarks and the Pioneers”. Margot wrote half the book in 1980 with Alan Buckingham. Each edition had 1,000 copies printed. ‘SOME HISTORY OF SIMMONS REEF, BLACKWOOD’ published and printed 2007. In 2006 Margot was asked by the Blackwood Historical Society to compile a book on the History of Simmons Reef as they had a volunteer Grant to cover the cost of printing. Margot is trying to find time to finish her research and publish another book on the history of Blackwood, hopefully to be published in 2013 with the title ‘HISTORY AND PIONEERS OF BLACKWOOD‘ . Now over 600 pages of fascinating history of Blackwood. Also another book ‘THE BILLY PINCOMBE TRAGEDY – MURDER, MADNESS AND MANIA.” – The shooting of a Minister and Billy Pincombe at Blackwood, Victoria in 1908. HISTORICAL TRUE CRIME – THE EVENTS THAT LEAD TO THE INSTITUTIONALIZATION OF ONE PERSON AND THE SHOOTING OF TWO PEOPLE IN BLACKWOOD, OVER ONE HUNDRED YEARS AGO IN 1908. 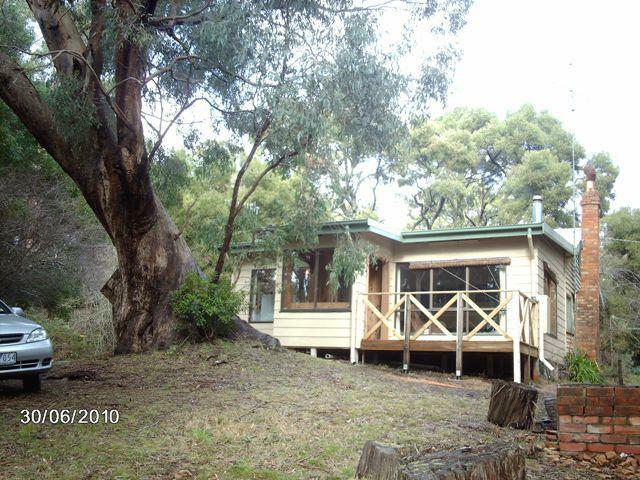 ‘CONNECTIONS WITH BLACKWOOD‘ Victoria – Margot’s grandchildren are the 5th generation to go to Blackwood for holidays. Margot’s family own a holiday house, called ‘Wannawong’, in Blackwood which was built for Margot’s grandfather, Walter Warner in 1930. Margot has over recent years finished the renovations with help from several builders. Her great-grandmother, Fanny Eliza Conlon (nee Burrows) went to live in Blackwood in the late 1880‘s with her daughter Frances Kate Warner (nee Conlon) who went to school in Blackwood from the age of 6 – 12 years. Margot’s holiday house at Blackwood house for RENT. Available at times to rent for holidays or short term by contacting Margot – email by clicking here . Family Historian – Has compiled the family Genealogical information and in so doing found some very interesting information. Margot is currently working on a book on the Burrows family, and her great great grandfather Henry Burrows, who arrived in Bendigo in 1856, and who was an engraver in the early newspapers in Melbourne. She has researched her father’s side with her Great Grandfather James Roberts, who came out to Melbourne in 1841, whose son Charles was in the Wiliamstown Water Police Her other Great Grandfather was James Conlon who was an early Melbourne Architect in 1872. Family surnames researched include, ROBERTS, JANES, GOLDSMITH, HITCHCOCK, WARNER, MASON, BURROWS, and CONLON. Genealogist – Margot was a member of the A.I.G.S. (Australian Institute of Genealogical Studies) and was a professional Researcher with A.A.G.R.A (Australian Association of Genealogists & Record Agents). Photography – having been a keen photographer since her Grandfather gave her first camera in primary school. Also working in the Customer Service Dept. at Kodak added interest to this hobby. Gaining experience in making copies off old photos especially ones of Blackwood, Margot has the biggest collection of Historical photos of Blackwood . Margot had a collection of photos on display at the Blackwood store now at the Blackwood Historical Society’s Museum. Margot has taken copies off old family photos and is currently in the process of scanning in old family photos onto disc and then transferring them onto CD.